Summertime Number 9A is a painting that longs to be understood. The black swirls fall like letters on the canvas, desperate to be read, and the subtle strokes of aestival colour signal a summer’s scene that is waiting to be experienced. The man responsible for this familiar yet infinitely puzzling piece is Jackson Pollock, arguably the greatest American artist of the twentieth century, and the headline exhibition at Tate Liverpool this summer. On attending the exhibition, I not only rediscovered my admiration for Pollock, but also learnt about the tragic life of this lost soul. The ‘real’ art produced by Pollock appears somewhere between himself and the canvas. His technique, his ‘pourings’, his sentiment, the beauty created by the artist – that is the art. What I find most impressive and awe-inspiring about Pollock’s work is that the images on the canvas (or paper, as the case may be) are not the principle focus. The ‘real’ art produced by Pollock appears somewhere between himself and the canvas. His technique, his ‘pourings’, his sentiment, the beauty created by the artist – that is the art. The results we witness in the exhibition can only be an imitation or a by-product of how much Pollock really achieved. Through pioneering this type of ‘Process Art’, Pollock really challenged the popular concepts of modern art in the fifties. Until then, modern art had mostly been dominated by artists such as Salvador Dali or Andy Warhol with their highly artificial styles, which heavily contrast with Pollock’s purity and authenticity. 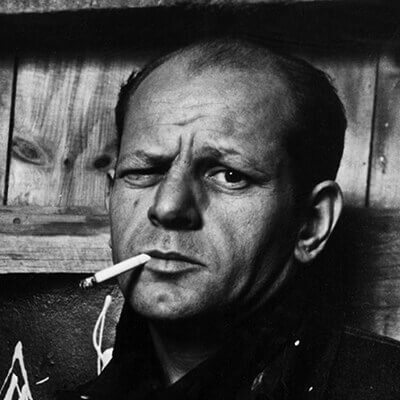 At first it is difficult to think of any of Pollock’s pieces being representational –least-of-all his legacy piece ‘Portrait and a Dream’- because their aesthetic is so abstract and unlike anything in the physical world. However, I have never encountered an artist who is as honest with his audience as Pollock is. His creations are products that come directly from his mind. The lack of structured planning, and the emotional ‘pourings’ of black paint directed by his subconscious psyche, invite the viewer to take a glimpse into Jackson’s tragic and troubled mind. His battles with depression and alcoholism, beginning around age fifteen, can be seen in most of his works. In a previous article on the Tate’s exhibition of Andy Warhol’s work, the gallery was criticised for not having engaged with the art they displayed. This time though, Liverpool’s gallery had incorporated Pollock-like elements into their setup. Greyscale walls in the hall highlight melancholic and mournful themes in the art – the café even payed its own edible tribute to the artist with Pollock-influenced splatter cupcakes on sale. Jackson Pollock: Blind Spot is being exhibited alongside Glenn Ligon: Encounters and Collisions at Tate Liverpool until 18th October 2015.